Call it a win for color. 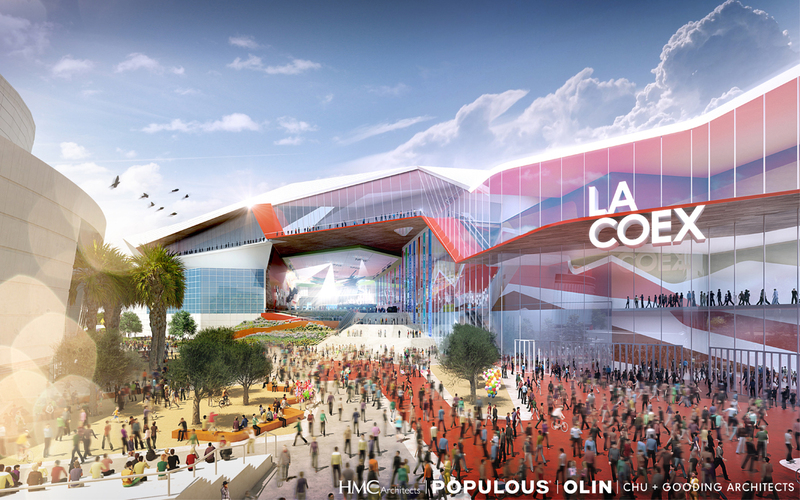 A bright-hued design for the renovation and expansion of the Los Angeles Convention Center by Populous and HMC Architects beat out the gray proposals by the other two finalists—Gensler and Lehrer Architects and AC Martin and LMN Architects—in a city-led competition. 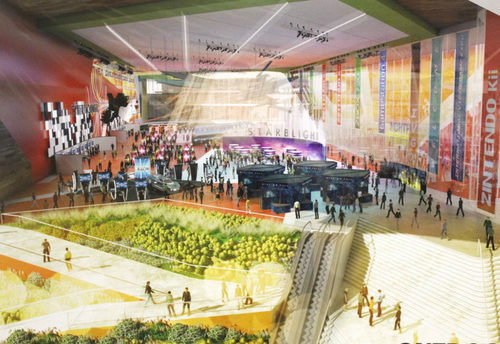 As previously reported by AN, the competition and design selection marks an important first step in the “Expansion and Futurization Project” led by the L.A. Department of Convention and Tourism Development and the Bureau of Engineering, which sees remaking the currently dowdy and cramped convention center as critical to attracting conventions, events, and investment to the area. A four-representative panel from the city’s tourism and engineering departments selected the winner. Each proposal was required to come in under a budget of $350 million. 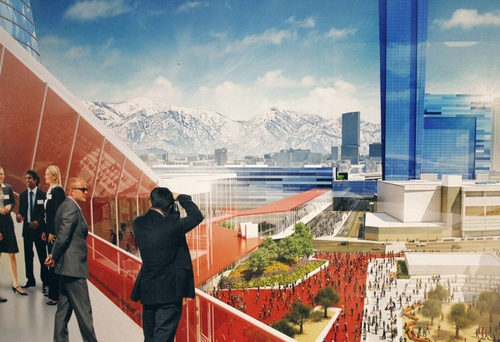 Populous and HMC Architects’ team includes landscape firm Olin and Chu + Gooding Architects. 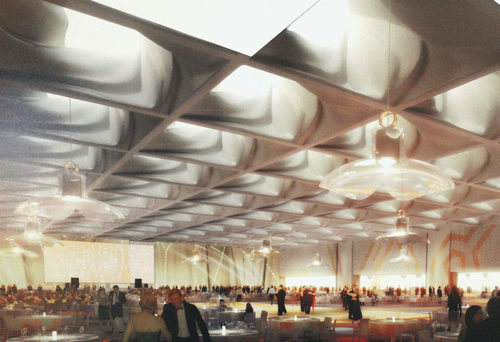 Per the brief, their design connects the South Hall and West Hall of the convention center with a structure over Pico Boulevard and expands the venue with more meeting rooms and a series of outdoor multi-use spaces, including a covered, but open-air performance venue overlooking a refurbished Gilbert Lindsay Plaza. Op-art supergraphics unite the scheme, with a tomato red and white stripe pattern appearing as paving, wall treatments, and architectural elements. 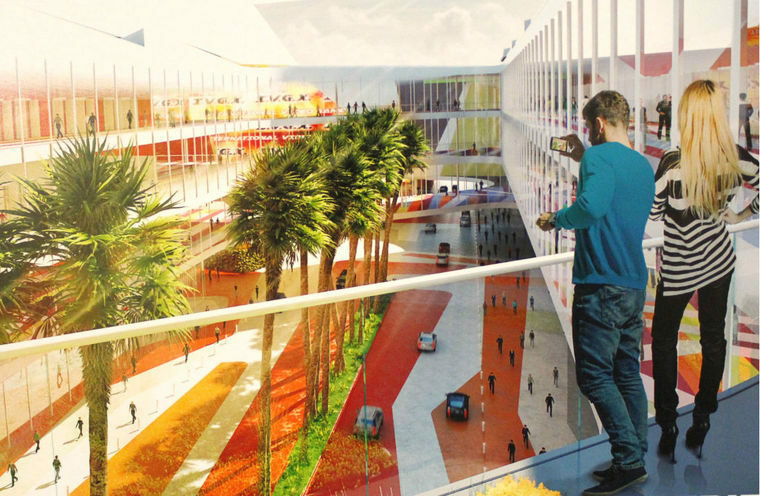 It’s a bold take on the conventional convention center approach, which for years was marked by interiority and overall blandness. Like the dazzle dazzle camouflage used on battleships, the move lessens the building’s bulk while making it infinitely more exciting. The Populous/HMC proposal now goes to the City Council for approval.